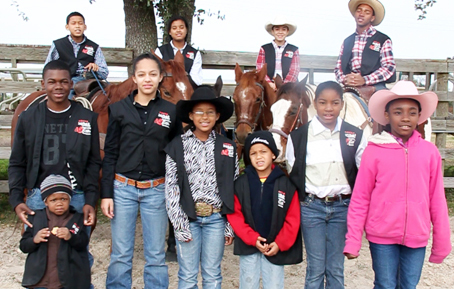 Members of the All American Fresno 4-H Club in Fort Bend County are the 2011 winners of The Houston Livestock Show and Rodeo AG4U Video Challenge. Their entry, A Community of Anticipation, demonstrates what being ambassadors for agriculture is all about. Timothy Sandles, Prairie View A&M University Cooperative Extension agent in Fort Bend County works with the young people in this club throughout the year exposing them to many opportunities available in 4-H. Numerous entries were accepted but The All-American Fresno 4-H club won 1st place. Club members did all the shooting for the video as well as came up with the concepts. A Community of Anticipation can be seen on Cooperative Extension’s YouTube channel. The majority of these young people who developed the video grew up in limited resource communities and have not had a lot of exposure to 4-H. “The fact that our 4-H Club is doing positive things for their communities and also recognizing the importance of agriculture is a testament that 4-H plays a vital role in their lives,” said Sandles. Alecea Rush, communications specialist with the Cooperative Extension Program, worked with Sandles in helping the 4-Hers bring out their best performances when developing the video. “Ms. Rush was certainly an asset to us in that she showed our youth how to handle the video camera to take the best possible shoots,” Sandles said. The All American Fresno 4-H Club will receive a $500 award and a trophy for their 1st place win during the Houston Livestock Show and Rodeo’s Ag Forum beginning at 3:00 p.m. in the Main Arena of Reliant Center on March 8th. The video will be played during the Houston Livestock Show and Rodeo on a monitor in front of the Tours Committee Office and on the big screen at the Ag Forum. Interested persons can contact Timothy Sandles at 281/342-3034, tsandles@ag.tamu.edu, pvcep.pvamu.edu for more information. This entry was posted on Friday, February 25th, 2011 at 9:55 pm and is filed under Agriculture and Natural Resources. You can follow any responses to this entry through the RSS 2.0 feed. You can leave a response, or trackback from your own site.